Amy, my garden guru…my seedlings are all falling over (still inside). What does this mean? They have enough water…what do I need to do to make them happy? First of all, I’m no garden guru! I only have two years experience under my belt. But I have learned some things along the way which I am happy to share via this blog. 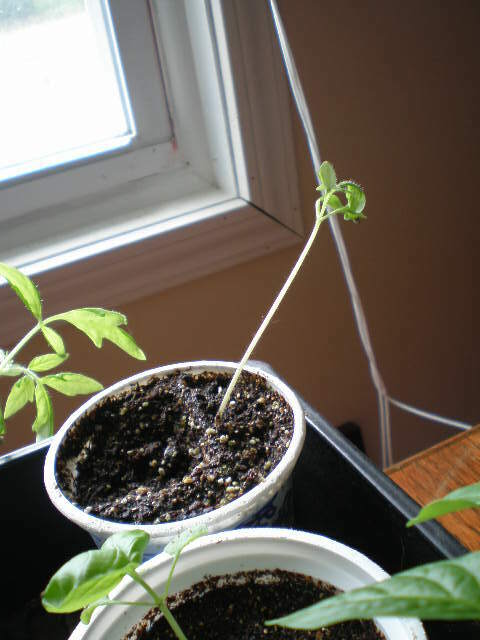 This tomato plant is leaning over the side of its pot. And I even repotted it into a larger homemade container! The plant otherwise looks very healthy so I’m not too worried. I’ll be transplanting him to the garden soon. Again, the pepper plant otherwise looks very healthy so I’m not worried. By healthy I mean that the leaves are green and there’s no yellow or brown spots. The leaves are not dying off. 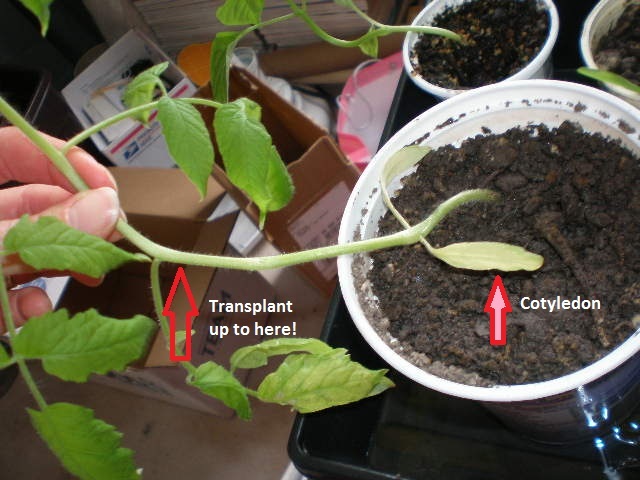 Remember cotyledons are not true leaves so they don’t count. Bury them in the ground. Plants will actually sprout roots off the part of the stem that is buried underground. A good root system makes the plant stronger and healthier and in turn gives you more veggies to enjoy! 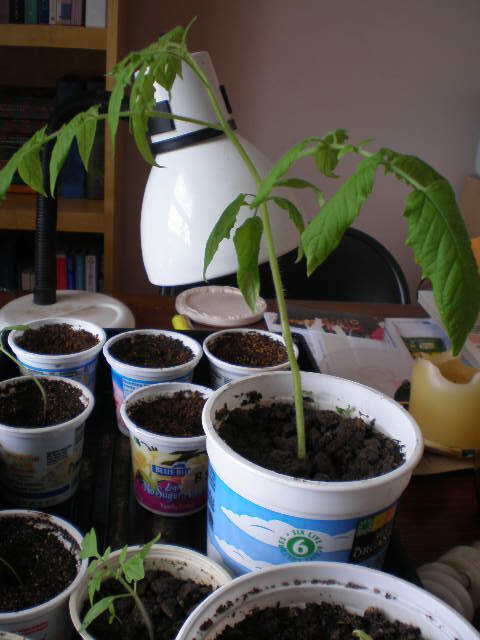 Seedlings get leggy because they are reaching for a light source. If the light is too far away they will reach higher and higher to get to it and as a result their stems are not very strong. To solve this problem put a light source closer to your plants. I put a lamp on mine when they are just sprouting. This guy was a late germinator so the lamp was off when he started growing, hence the legginess. 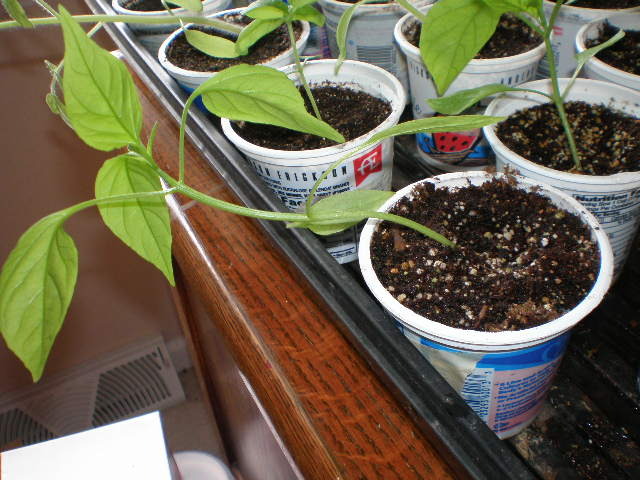 Finally if your seedlings are falling over it may be because they need water. Are you keeping them moist enough? If they look a little wilted and are leaning over, give them a good drink of water and check on them in 12-24 hours to see if it makes a difference. Amy, your information on leggy seedlings is spot on correct. Wonderful job! where were you the other day when I needed you? 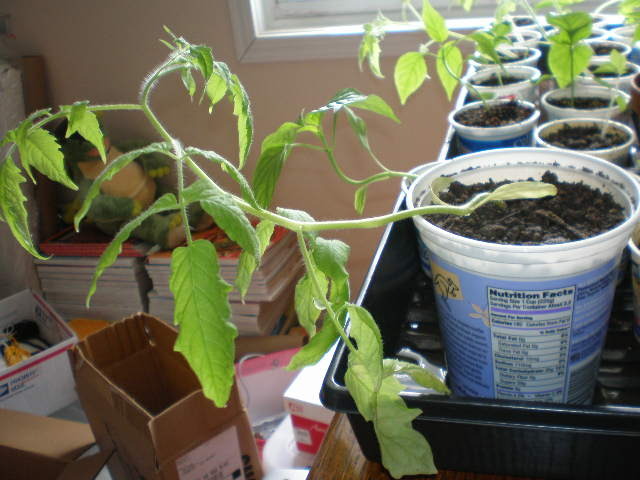 I posted one about this very thing…and it was only after I planted the tomatoes out into the garden that it occurred to me that I SHOULD have planted into a larger pot first.